3. "And there were Giants on the Earth in those days..."
The greatest East Anglian churches were built in the 15th century. It is often observed that there can never have been enough people to fill them, but this is to miss the point. They were never intended for the forms of worship to which they now play host. The shape of a late medieval church is not an accident. East Anglian parish churches of the 15th century had many common features; wide aisles to enable liturgical processions, a chancel for the celebration of Mass, places for other altars, niches for devotional statues, a focus towards the Blessed Sacrament in the east, a large nave for social activities, large windows to fill the building with light, a roof of angels to proclaim a hymn of praise, a pulpit for the preaching of orthodox doctrine, benches to enable the people to hear the preaching, and carvings, stained glass and wall paintings of the sacraments, Gospels and rosary mysteries, of the catechism and teaching of the Catholic Church. As Le Corbusier might have said if he'd been around at the time, a late medieval East Anglian church was a machine for making Catholicism happen. No longer, of course. The radical and violent fracture in popular religion in the middle years of the 16th century gave birth to the Church of England, and the new Church inherited buildings that were often unsuitable for congregational protestant liturgy - a problem that the Church of England has never satisfactorily solved. Over the centuries, the problem has been addressed in different ways; celebrating Communion at a table in the nave, for example, and blocking off the chancel for other uses. Although this was challenged by the Laudian party in the early part of the 17th century, it was the way that many parishes reinvented their buildings, and most were to stay like that until the middle years of the 19th century. Some went further: a pulpit placed halfway down the nave, or even at the back of the church, meant that the seating could be arranged so that it no longer focused towards the east, thus breaking the link with Catholic (and Laudian) sacramentalism. For several centuries, Anglican churches focused on the pulpit rather than the altar. With the rise of the 19th century Oxford Movement, all this underwent another dramatic change, with the great majority of our medieval parish churches having their interiors restored to their medieval integrity, reinventing themselves as sacramental spaces. This Victorian conception of the medieval suited itself to congregational worship, and responded in a satisfactory way to the structure of the building. But still, of course, they weren't full. This 19th century reimagining is the condition in which we find most of them today, and Anglican theologians everywhere are asking the question that the Catholic Church asked itself at Vatican II in the 1960s - is a 19th century liturgical space really appropriate for the Church of the 21st century? It requires a shift in the mind to recall that these were not originally Anglican buildings, but it is a shift we need to make. The idea of a previously unchanging Church now confronting the demands of the modern age is wholly incorrect. These buildings have faced a variety of challenges over the centuries; they have only ever been truly suitable for the use for which they were originally built six hundred years ago. Two of the largest late medieval churches in East Anglia are just three miles apart, at Cawston and Salle in the middle of Norfolk. These clusters are not uncommon; think of Blythburgh, Southwold and Walberswick in Suffolk, for example, or Lavenham and Long Melford in the same county. But Cawston and Salle are really close - you can see the tower of one from the other. St Peter and St Paul is a complete example of a 15th century rebuilding; St Agnes at Cawston retains its elegant earlier chancel. If not merely for congregational worship, why were these churches built so big? Impressive as they seem now, they must have been awesome at the time they were built, since they were the only substantial buildings outside of the towns, and would have dwarfed the houses of the parish. Some were in villages; but many were not. 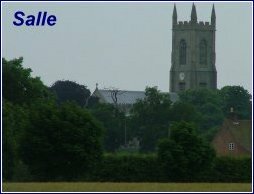 Salle church has always been out in the fields. Why are earlier East Anglian churches not so massive? Certainly, East Anglia has its cathedrals; Norwich and Ely predate the great churches by several centuries, and Bury Abbey was bigger than either before its destruction. The great majority of East Anglia's churches are piecemeal affairs; typically, a 13th century chancel, which must have been the most substantial part of the building when it was first erected, an early 14th century nave and tower, and perhaps later elaborations of the piece with aisles and a clerestory. 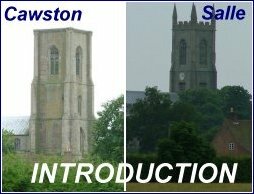 Salle and Cawston churches are both rebuildings of earlier structures, but a surprising number of East Anglian churches were not rebuilt, until perhaps the Victorians saw the need for a new chancel, or new aisles. Often, these smaller churches are exquisitely beautiful, as if beauty rather than grandeur was the imperative. And then, towards the end of the 1340s, a great pestilence swept across Europe; in East Anglia, outside of Norwich which got off lightly, it killed perhaps a half of the population. In emptying the countryside, it completely altered the economic balance; a shortage of labour gave new power to the survivors, perhaps setting in place the preconditions for the capitalism that we can recognise by the 16th century. And, in extinguishing the flower of Decorated architecture, it also gave birth to the great love affair between the late medieval mind and death. In Catholic theology there is no great divide between the dead and the living. For the medieval Christian, communion was something that existed between all members of the parish, whether alive or dead. Thus, prayers were said for the souls of the dead (who, it was presumed, were saying prayers for the souls of the living). To ensure that prayers were said for them after their death, the very richest people endowed chantries. These were foundations, by which priests could be employed to say masses for their souls in perpetuity. A priest in such a capacity was called a chantry priest. The masses would be said at a chantry altar, probably in the nave; if the person was rich enough, this might be enclosed in a specially constructed chantry chapel. Many churches had them. After the Reformation, many were pressed into service as family mausoleums or pews. For the poorest people, there was the opportunity to join a guild, where, for a penny or so a week, they could ensure that the guild chantry priest would say masses for their soul after their death (along with those of the other dead members of the guild). Many of these guilds were organised around particular occupations or devotions, and became a focus of social activity. We know a lot about the guilds of Cawston. The investment that produced the income to pay the chantry priests was most commonly in land. The church or guild oversaw the management of the land, which is one of the reasons we have an image of a wealthy pre-Reformation church. Land bought to produce income in this way was known as chantry land, a name surviving in many places today. Those who invested in chantries (and few and far between must have been those who didn't) presumed that they were ensuring prayers and masses in perpetuity; but, of course, this was not to be. Bequests and chantries seem to have reached their peak in the 15th century. Perhaps the Black Death reinforced the urgency of the task. People did not merely want to be remembered; they wanted to be prayed for. And so, those who could afford it ensured that this was not forgotten by leaving their wealth in the very place that was at the centre of communion: the parish church. The richest paid for the additions of aisles and chapels, or for a new font or rood screen. Their gift would be recorded in the form of a dedicatory inscription. One of these survives on the screen at Cawston, and another on the base of the font at Salle. Orate pro anima, they begin, "Pray for the soul of...", an injunction urgently emphasised by the pre-Reformation liturgy, only to be cursed and defaced by the later Anglicans and puritans. Stained glass was another common gift, as well as images, candlesticks, furnishings. Thus were many churches developed piecemeal. But sometimes, where a parish could rely on a steady supply of substantial bequests, they might be channelled into a complete rebuilding, as at Salle, where the new church of the late 15th century survives in pretty much its original form. Sometimes, a single wealthy family would shape and direct the rebuilding of a church. One of the richest families in East Anglia in the 14th and 15th centuries was the de la Poles, the Earls of Suffolk. Their mark can be found throughout East Anglia, but most famously and substantially at Wingfield in Suffolk, and here at Cawston in Norfolk. 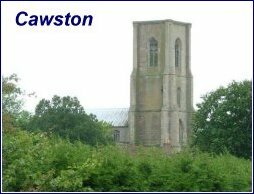 Theirs was a long term project; at Cawston, the tower predates the furnishings of the nave and chancel by almost a century. So why so vast? Certainly, it was ad maiorem deo gloria, to the Greater Glory of God; but it was also to the greater glory of the de la Poles and their contemporaries. The great landed families of England came into the late middle ages full of confidence, and they were determined to demonstrate it. They had survived the Black Death. They had grown richer on its consequences. They had assumed a political power unthinkable a few centuries before. They controlled not just the wealth but the imagination of their parishes. They asserted orthodox Catholic dogma in the face of rural superstitions and abuses. They imposed a homogenised Catholicism on late medieval England. And, as they increased their secular power and influence, a time would come when they would embrace the Great Idea already beginning to take shape on the continent - protestantism. But that was still in the future.